What does independence mean? According to the Cambridge dictionary it means freedom from being governed or ruled by another country. Independence means living a life without being influenced or helped by others. 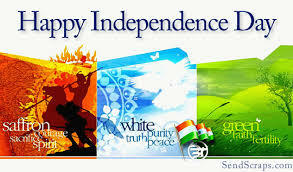 On 15th August, India will celebrate its 70th Independence Day or Swatantra din. India got its independence from the British Empire. With each Independence Day we are also reminded of the Partition of India and Pakistan. Every Independent country or State that looks after its citizens, makes its citizens to feel proud and patriotic. As an Indian born in Kenya, what are my feelings and thoughts for India? I am lucky to have a strong connection with India though having been brought up in Kenya. My mother was born and brought up in India. My father sent me to a boarding school in Mt.Abu when was only 12 (Uganda exodus scared all the Asian communities in East Africa). I got admission in Sophia High School in May and my first India Independence Day celebration was a memorable one.We had to wear our girl guide’s uniform which was white salwar kameez with a blue dupatta and white tackies as we called them. The flag was hoisted and we sang the National Anthem and other patriotic songs. After the ceremony we all got nice orange laddoos and the rest of the day was spent with a trip to the town, good food and a sweet treat again in the evening. This whole experience had a great impact on me as it was the first such ceremony I participated in. Don’t get me wrong Kenya too celebrates its Independence Day but normally during that time schools are on holiday (12th December). We would watch the President hoist the flag, sing the National Anthem and watch the parade on the television. My husband qualified as a doctor from India, my kids went to high school in India, my mother in law and daughter live in India, we visit India every year. There is something that beckons us to visit it ever so often. and I are in the Orange group. are in the White group. are in the green group. We all have to prepare a traditional dish according to our colour theme.You may be wondering why those colours. The tiranga or the Indian flag has a band of 3 equidistant colours. The orange, saffron or bhagwa colour on top denotes courage and sacrifice or selflessness. The white in the middle represents honesty, peace and purity and the green at the bottom symbolizes fertility or growth, vibrancy and prosperity. The Ashoka Chakra or Wheel of Law with 24 spokes appears in blue in the middle. To know more about the Indian flag read here. Before I introduce the recipe to you, I’ve got to explain what the above title Vande Mataram means. It means I pray/bow down to thee Mother. Here the reference is to our Motherland India. Many Indians living outside India still have a strong connection to the Motherland and feel proud to be Indians. Though to some this may appear as a split loyalty to India and Kenya, I believe that probably some of us are very fortunate to profess our loyalties to not one but two nations. This helps us to create a better understanding of different cultures and live in harmony with all. I bow down to my Motherland and my birthplace too. I’ve been really busy this week with a Shrimad Bhagwat Saptah so haven’t been able to plan a proper India Independence Day theme.To celebrate India’s Independence Day, here’s a Gajar Halwa recipe with both orange and saffron flavours. The orange halwa is the main colour and by sprinkling almonds and pistachios on top I have incorporated the tiranga(tricolours) colours. Mix 1 tsp ghee(take from the measured ghee) into the milk powder. Add 1 tbsp milk(take from the measured milk) and mix into a crumbly consistency. This is homemade instant khoya (mawa). Leave on the side till required. Heat ghee in a pan. Add the grated carrots and stir fry for 5 minutes. At this stage the carrots will become a bit pale and soft. Add milk and saffron.Cook on medium heat, stirring frequently till the milk is reduced to half the quantity. This will take about 15-20 minutes. Add the milk powder mixture, orange juice and sugar. Mix well. At this stage the mixture will be very liquidy again. Cook the mixture further till no more liquid is left. This will take another 15-20 minutes. Stir frequently so that the mixture does not burn or stick to the bottom. When the halwa is done, the carrots will be cooked, and no liquid will be left in the pan. At this stage add the raisins and extra 1 tsp ghee.Mix. Take the pan off the heat. Add the orange blossom water and mix well. Spoon the gajar halwa into serving bowls. Sprinkle the top with chopped almonds and pistachios. Serve hot gajar halwa. Another exciting and my favourite way to serve gajar halwa is with a dollop of ice cream. To prepare normal gajar halwa add 1 cup of milk instead of orange juice and add cardamom powder instead of orange blossom water. Slightly brown sugar will not give you the required orange colour, so use white sugar. Don’t cook the halwa over high heat. Add ¼ cup fresh khoya or mawa instead of the milk powder. Perfect dessert for this day dear. Happy Independence day. Gajar ka Halwa looks tempting Mayuri. It's an apt dessert for this great day to celebrate.. Tempting and flavourful share Di! The citrusy aroma and tangy flavour of the orange juice have compelled me to imagine the taste of the Halwa! ���� So getting tempted! Bookmarking this innovative recipe idea of yours. Wishing you a Happy Independence Day in advance! Yummy gajar halwa and beautiful bowl. Loved it. Gajar ka halwa looks delicious my favorite. Yes, though I wasn't born there, still feel I miss India. Thanks Pushpita, got the idea from carrot orange muffins and also thought that orange and saffron combined taste really heavenly. Thanks Sujata. The bowl was a present for my nephew's wedding and I too love it. Thanks Saswati. Try it, its different and not too sweet.